Requires all three sides of triangle. Requires two sides and one included angle. Requires two sides and a non-included angle. Requires one side of the triangle and two adjacent angles. Requires two angles and one opposite side. Requires side length of the equilateral triangle. Requires two side lengths of a right angle triangle. A triangle is a special closed shape or a polygon that has three vertices, three sides and three angles. A vertex is a point where two lines or sides meet. Since a triangle has three sides, it also has three vertices a, b and c. The total of interior angles, is always 180°. A triangle can be classified based on their side length and interior angles. For example, a triangle with equal side lengths can be identified as equilateral triangle or a triangle none of the lines / sides having same length is scalene triangle. Triangles can be classified as 6 different types, based on their side length and angles. A triangle where all three angles are less than 90°. ∠ABC, ∠ACB and ∠BAC are all acute angles. A triangle which has one angle of 90°. ∠ABC = one right angle. In obtuse triangle, any one of the triangles is greater than 90°. When all side lengths of a triangle, are equal. It’s called equilateral. Here AB = BC = CA. A triangle with at least two sides of equal length is Isosceles triangle. A triangle where all sides are of different length. A triangle cannot have more than one sides greater than or equal to 90°. As mentioned above in triangle definition, a triangle is a closed path. The sum of all internal triangles is always 180°. The total of any two side lengths is always greater than the third side length. Pythagorean theorem, is a theorem about right triangle. According to Pythagorean theorem, a square of the length on hypotenuse side (longest side) is equal to the total of two other sides. Any triangle that satisfies this condition is a right angled triangle. 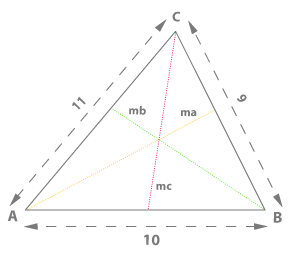 Median of a triangle is the length of a line that is drawn from the vertex of a triangle to the midpoint of the opposite side. A triangle has three medians which intersect each other at centroid of triangle. A centroid is arithmetic mean position of all the points in triangle. 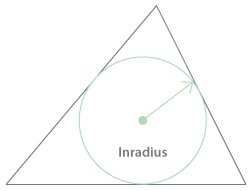 The inradius is the radius of a circle drawn inside a triangle which touches all three sides of a triangle i.e. inscribed circle. The center of this circle is the point where two angle bisectors intersect each other. It’s perpendicular to any of the three sides of triangle. 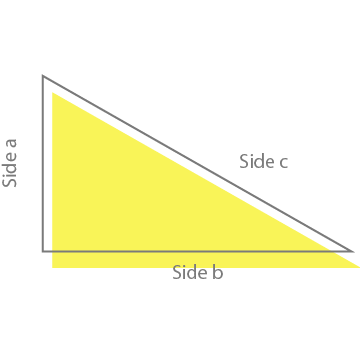 Where a, b and c are the side lengths of the triangle. 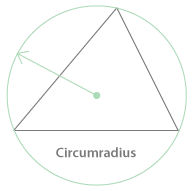 In case of triangle, the circumradius is the radius of a circle that passes through all the vertices of a triangle. The center point of this circle is called circumcenter. Circumcenter is a point where all perpendicular bisectors of each side of a triangle meet each other. Where a is a side length and A is the angle opposite side a. Although side a and angle A are being used, any of the sides and their respective opposite angles can be used in the formula. To understand how to calculate square footage we must first begin with the definition of area. An area is the size of a two-dimensional surface. The area of a triangle is the space contained within its 3 sides. To find out the area of a triangle, we need to know the length of its three sides. The sides should be measured in feet (ft) for square footage calculations and if needed, converted to inches (in), yards (yd), centimetres (cm), millimetres (mm) and metres (m). Our Triangle Calculator helps you calculate the area required for a triangle shape. Although we cover most common use case e.g. You may know two sides and an included angle but would like to know the missing side length. we have also recently added Right triangle calculator which also a commonly used in a scenario where you know two side lengths of a triangle one of which is 90° Deg. You need to know the length of the three sides of the triangle in either feet (ft), inches (in), yards (yd), centimetres (cm), millimetres (mm) or metres (m). You can calculate the area of the triangle in square feet, in square inches, square yards, square centimetres, square millimetres and square meters. Yes, our tool is that awesome.